Dubai, UAE, April 07, 2019: Almost 1000 children from across the UAE took up the mighty challenge to test their mental math skills, racing their minds against time to calculate 200 arithmetic sums in a matter of 8 minutes in a highly charged, competitive environment. At the recently held 16th UCMAS National Abacus Mental & Arithmetic Competition 2019, more than 30 nationalities across the UAE participated to bring to the fore few of the fastest human calculators in the country. The event also saw an impressive participation of Emirati students, who were second-highest in number after Indians and won several prizes. In total, around 200 contestants won awards in categories including Grand Champions, Champions, Runners Up (1st to 5th), Little Star and Radiant Star, besides merit awards presented to several participants for their accomplishments. Students from India, UAE, Jordan, Sri Lanka, Egypt, Pakistan, Britain, USA, Philippines, Iraq, Canada, Algeria, Palestine and Bangladesh swept away most of the prizes and were appreciated for their quick-thinking and nimble-mindedness. The competition was conducted in two sessions, with participants grouped in 24 categories based on age and level completion. Each contestant had to answer 200 math questions that were presented visually in just 8 minutes. Juniors were tested on addition and subtraction, while at the senior level the stakes got higher and competition toughened to include multiplication and division as well. Commenting on the contest, Mrs. Soundari Raj, Managing Director of UCMAS UAE, said, “As always, it was encouraging to see a large mix of nationalities with a competitive spirit among the participants. Children and young adults nowadays need more challenging diversions to keep themselves occupied as compared to earlier generations. With UCMAS, they have the option to test their limits and in fact push the envelope to the next level. Mental arithmetic is as much a skill as it’s an art and at UCMAS we nurture this skill and guide our students to use their brains constructively helping them to sharpen and exercise their minds to maximum”. Mr. Swarup Amminaeni, Executive Director, UCMAS-UAE congratulated the winners and their parents and added: “This learning is not just about mental math; at the end of the day, it is helping children build resilience, and preparing them to face problems they may come across in life as they grow older. They learn that hard work and dedication brings result. 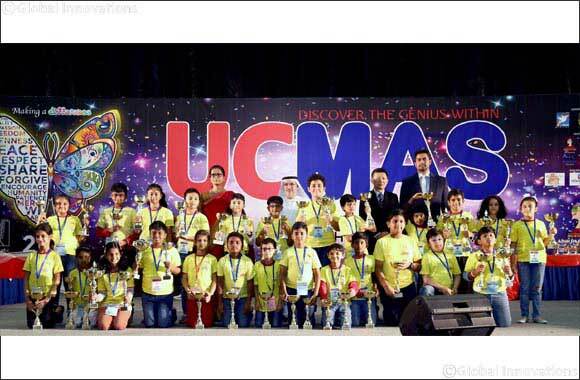 Essentially, UCMAS is encouraging healthy attitude of competition among children and teenagers which should be inculcated at a young age”. The Universal Concept of Mental Arithmetic System (UCMAS) is an internationally acclaimed skill and mental development programme that promotes mental arithmetic system designed for children between 4 and 13 years. During the course of study children learn time management, self-discipline, problem solving techniques improves the listening and visualization skills while learning to multi-task. The program helps in holistic brain development, improving concentration, observation, memory, imagination and creativity while developing skills such as judgment, application, reasoning and self-confidence. At present, there are 36 centers in the UAE teaching over 4000 students. Chief guests at the event included Mr Ngew Khoo Hoe – Associate Director, UCIC International Headquarters, Malaysia and Dr. Fazal Malik, Dean of Humanities, Art & Applied Sciences, Amity University.